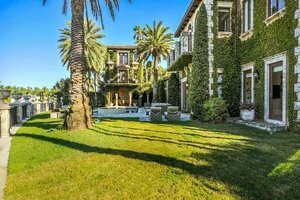 This Villa is a spectacular ivy covered waterfront residence in a prestigious guard-gated community. It is perfect for a Photoshoot, Product Launch or Showroom. Completely private and gated, this villa offers an expansive waterfront with beautiful wide water views and a large dock. The home is composed of a spacious living room, dinning room and media room surrounded by keystone lined walls, arched windows and a wood trestle ceiling as well as a state-of-the-art kitchen with a granite-topped cooking island and breakfast area. 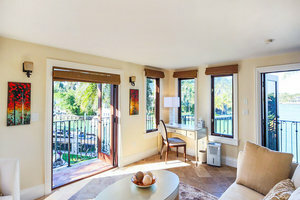 The bedrooms include a master suite with walk-in closets, 3 additional king suite bedrooms, 2 bedrooms with a shared bathroom, 1 suite with 2 twins as well as a private 2 story guest house suite with a king bed. If that wasn't enough there is a heated pool and jacuzzi, outdoor dining area and a Van Dutch 44 classic day boat available for additional fee at the property. This space is an opulent option, perfect for your next pop-up event.